This is a Peer Supported Chat not meant to replace a regular therapy session. It is NOT Crisis Intervention, but a time of learning and sharing of experiences by those who are living with Dissociative Disorders. Sharing of ideas, support, and experiences—without going into details---are welcomed and encouraged. This is a Welcoming group that is for-but not limited to-those of the PC community who have a DX of Dissociative Disorder—from one end of the DD spectrum to the other. This includes but not limited to: Dissociation, Depersonalization, Dissociative Identity Disorder, and Dissociative Disorder NOS. It is a goal of this group to be able to accept, listen to, and support each other in the manner which we individually wish to be accepted, listened to and supported. *IF YOU ARE TRIGGERED AND ARE TALKING ABOUT ACTING OUT IN HARMFUL WAYS OR ARE IN A FLASHBACK OR ARE USING GRAPHIC AND TRIGGERING DETAILS AND WORDS, YOU MAY BE ASKED TO LEAVE CHAT AND GO TO SUPPORT UNTIL SOMEONE CAN TALK TO YOU. *Those who are in active crisis are asked to use self-care and call your therapist or emergency number. *IF you are triggered by something, please PM me and if you need support please wait in the support chat until someone can talk to you. If triggering brings a person into crisis mode, then use self-care and call their therapist or emergency number. *Those who have been drinking or are “high” are asked not to participate until they are sober. *Out of respect for each other it is asked that there be no flaming or disregard for another group member’s experiences or diagnosis. *Out of respect for the leader and other members, side conversations or going off topic with another person in the chat need to be left until after the group. It is distracting to others and to the leader when cross talk is going on. This will really help folks to find the guidelines. 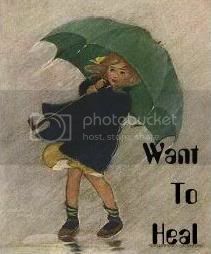 WantToheal sooo very much for posting this sticky. It is easier to find and I apprectiate it as well thanks so much. Have you seen our DD forum? Lots of good information and supportive peeople there. My past is not a memory, it’s a force at my back. It pushes and steers. I may not always like where it leads me, but like any story the past needs resolution. It is a miracle that I have survived thus far and I strive to help others see miracles in every day life. Thanks so much for having this chat... I haven't been able to attend yet, because I need five posts to join. I am working on that! I am just starting to learn about how this plays a part in my life. It will be great to hear other people's experiences.